Our landscape designs are created with one goal in mind, to create a beautiful landscape plan that achieves the final goal, control cost and provide instructions to our crews. With our state of the art 3D rendering program, we can work with you to help envision the potential of your new home! Adding a retaining wall can give you yard more usable space while adding a beautiful yet functional look. We understand the building codes and the construction requirements needed to build a long lasting wall. 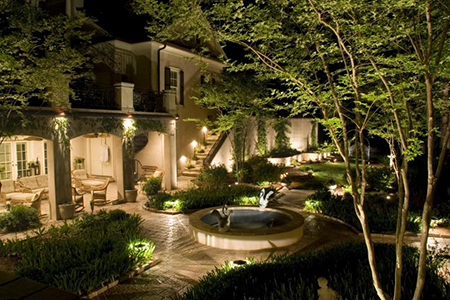 Landscape Lighting adds beauty, functionality and safety to your landscape. Up lights, path lights, wall lights and deck lights offer a unique style of your homes landscape, while offering the functionality and safety. Drought tolerant plants can be used in residential landscapes to effectively conserve water, reduce maintenance and lower the cost of a beautiful yard without heavy water consumption. Landscape irrigation offers a solution for watering all types of vegetation. We are specialist in low water use irrigations system like drip, turf, shrubs, ground cover and fruit tree systems. Decorative concrete is an attractive and economical alternative to natural colored broom finished concrete. We can add different textures and colors to the surface of concrete giving it the real feel of natural stone or tile without the cost. Artificial turf offers a real solution for the growing cost and shortage of water need to grow a healthy looking lawn. Synthetic turf looks and feels real making it the best way to have a pristine green lawn all year round. California offers many great features and one of them is Outdoor Living. Let us help you create a living space outside your home that you can enjoy all year round. We are experts at all phases of wood working. Add a deck, patio cover, arbor trellis and fencing to your landscape. We build it right and long lasting. 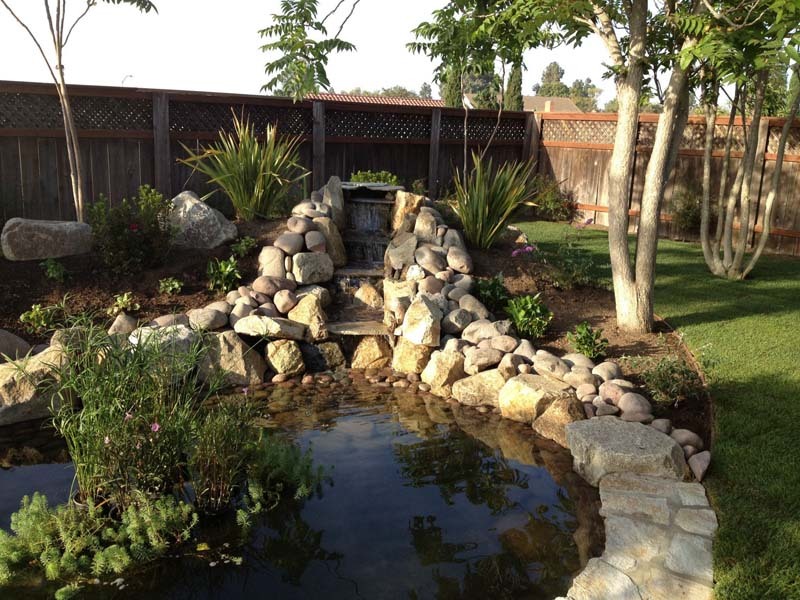 Let us help you create a special feature in your backyard by adding a water feature or pond. We have experience building water features, ponds, waterfalls, fountains, pond less water features and more. 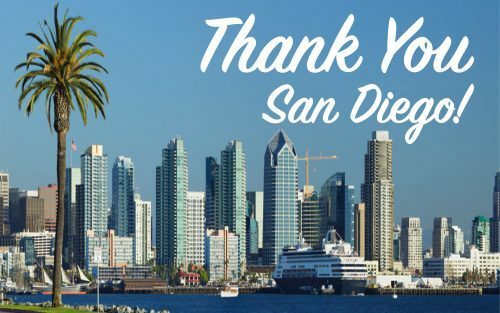 Thank You San Diego for over 30 Years of Business! Emerald Landscaping has had the pleasure of proving 5 star service to the greatest community of San Diego for over 30 Years! We are proud to be a part of keeping San Diego beautiful! Tell us about your project and we will call to schedule an appointment to discuss and view your project, then give you a competitive estimate. We offer all estimates submitted via the web priority. Take a look at our photo and video galleries to learn more about our past landscape projects. This is a great place to start if you need ideas or want to see our work up close. We have hundreds of photos that are categorized for easy reference. Designing your landscape project is the first and utmost important part. This is your blueprint, information source, and your success to having the perfect project turn out just as you planned. Let Emerald Landscaping's team of professionals design your next landscape overhaul! Luke did an especially nice job on our yard today. He trimmed the plants away from the backyard walkways, cleaned up leaves along inside wall of backyards and under plants as well as other things. Judy and I appreciate the extra effort ! We want to thanks you for doing such a wonderful job on both our landscape and landscape you, along with your crew, went to a lot of work to make us happy and we definitely are! Andy and the entire crew of Emerald Landscape worked diligently to complete our front yard remodel. All members of the crew were friendly, respectful and hard-working. There always seem to be “bumps in the road” with any construction project and we appreciated the sincere efforts by Andy and his crew to help us get the best results possible. It’s impressive to see a family working together and to feel that everyone on the job is vested in creating a finished product to be proud of. Thanks to the crew!! Hire again? Yes! Have used them twice and I couldn’t be happier! In the 24 years that I have owned my house and I have used many different contractors, landscapers, etc and hands down Emerald Landscape was the best. They were on time and always friendly. The quality of their work even satisfied my picky husband. They even left my yard clean after they were done with their work. We just wanted to thank you for the wonderful job you did on Dad’s hill! Thanks for your honesty and integrity! Your work men were courteous and polite. You came in under the estimated cost and in the exact amount of time you said it would take. We will recommend you to anyone we know needing landscape work. Emerald is Great! They came to the job on time, every time and designed my dream Backyard! Andy was honest and did exactly what we had planned. I would recommend them to anyone looking to do landscaping. Ken leaned over backward to make sure things went right all through our project. His customer service skills were awesome and I like how professional they were at every step of the way. I had a designer draw up the plans for my back yard and I had three companies give me estimates on the work. Compared to the other two companies that bid on my project, Emerald’s estimate was so much more clear and professional. It had a lot of detail, which I liked. During the project, there were a few changes, mostly things we asked for. Ken got us revised numbers ahead of time so that we could decide what to do. It made me feel like they had things under control and weren’t trying to trick us or get more money out of us. Our project turned out really well and now we feel like we just want to spend all of our time out doors! Everything looks so much cleaner and more put together- we are just really happy with our new yard and that we decided to chose Emerald to do the work. Contacted 6 companies, and only got back 3 quotes. Andy was by far the best priced. His quote was concise, well written, and listed line by line, so there were no surprises and everything was upfront. He did a complete remodel of our backyard. Installed a retaining wall, removed old concrete, poured new concrete. His team is very professional and very easy to work with. He’s a small business owner and takes pride in a quality job. Any problems I had (you will on any job), were discussed and rectified on the spot. I highly recommend him. Emerald Landscape did a fantastic job on our back yard; waterfall, drainage, flagstone, hot tub concrete, etc. We had obtained 3 bids and they provided the most reasonable and detailed proposal. We had a few change orders for things that we increased but I would say they were very fair. They also made some small modifications and adjustments without charging. I would definitely hire them again. Also, when in the beginning they were the most responsive landscaper when I was calling for bids. This is the second job Emerald has done for us. They’ve built 2 walls, repaired lifted pavers around our pool, cleared canyon space. poured a concrete walkway down the side of our house, and bricked out flower beds in the front of our house. Andy and his brother were professional, completed all work on time and were reasonably priced. I will not hesitate to use them again and happily recommend them. Our backyard was in rough shape. There was crabgrass, mounds of dirt, rock, old 1980s patio block…. it was depressing. I met with Andy and got an estimate. He was a recommendation from my boss at work. After seeing the price, it was definitely fair compared to others. The fact that he took the time to come out and give me an estimate and come back again to refine that estimate after some changes speaks volumes. Too many companies wanted to just do things over the phone. The work that Andy and his crew was great. I have to say that I hawk eyed the project and it was the exciting part of my day to come home to the new changes. Andy was very receptive to answering questions and explaining things. I recommend that anyone who is putting a good amount of money into their property should keep up with the progress. If you don’t like what you see, you got to let the man know. I found things that I didn’t approve of and Andy was there to make it right. Thank you Emerald Landscaping for being patient with my changes, and for your great work. Here are some before and after. I’ll update the photos again once I can get some things cleaned up from another project. Thank you Andy. Andy came to look at my back hill, made some measurements and took pictures. His team created a digital image of what it could look like. His team was excellent and moved a LOT of boulders and rocks onto the hill to create a long dry riverbed, waterfall, several boulder retaining walls and a set of steps up the side of the hill. Andy’s team did an excellent job and I highly recommend them. I have to say that I was thrilled with the Emerald Landscaping Team! They did an awesome job cleaning up my backyard and the slope of a hill of an adjacent property that had been deemed a fire risk. The team was professional, excellent in their work and always kept me in the loop on progress being made. Emerald Landscaping exceeded my expectations and I would whole-heartedly recommend them for your landscaping needs. Andy, Angela and the entire team are the best! Andy, Luke, and their crew did a great job with our yard. The work was done in a timely and professional manner. Andy is very knowledgeable about landscaping and horticulture and cheerfully answered all our questions and concerns. They put in hand-made planter boxes, new plants, trees, flagstone walkways and patios, an irrigation system, and decorative stone walls. Now our yard is really beautiful and we’re so proud of it. We highly recommend Emerald Landscaping. Andy and his crew were excellent. Andy guided us in choosing a low water, relatively low maintenance, pleasing design our apartment complex. They are an efficient, clean, respectful crew. They kept very close to their projected time schedule, and their proposed budget. Andy was readily responsive to our inquiries and input throughout the project. We highly recommend Emerald Landscaping. © 2019 San Diego Landscape Contractors, Maintenance and Design Services. All Rights Reserved.